Moffat County High School sophomore Casey Nations tees off the 10th hole at Yampa Valley Golf Course. Nations and the Bulldogs were playing at their home tournament against 12 other high school teams Wednesday. 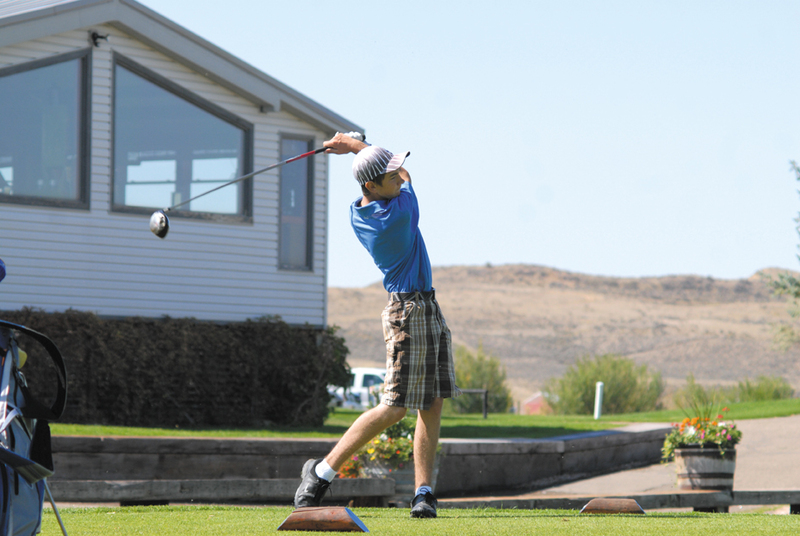 Even without any standout individual performances, the familiarity of a home course led the Moffat County High School boys golf team to a season-best. The Bulldogs, playing in their home tournament at Yampa Valley Golf Course Wednesday, shot a varsity team score of 295, five strokes better than their previous best on the season. While 295 was only good enough for 10th out of the 13 varsity teams attending, head coach Casey Kilpatrick was pleased with his players’ performances. Leading the way for MCHS again was Sophomore Casey Nations, who shot 93 on the day. Tyler Jenkins shot 99 and Colten Yoast had a personal-best 103 to give the Bulldogs their three-score team total. Playing well on the course in Craig that MCHS golfers are more familiar with was something Kilpatrick hoped to see. He said the players’ golf games are improving as well. Part of that improvement in the short game could be attributed to some special help MCHS players received in the week leading up to the tournament. While practicing at Yampa Valley, head golf pro Jason Back and Dave Desarmeaux worked with the Bulldogs on their chipping and putting. It is another way YVGC is accommodating to the younger players in the area. Kilpatrick said the tournament ran smoothly and he thought everyone enjoyed themselves, including the community members who came to support Moffat County and Steamboat Springs High School golfers. The Bulldog’s next tournament will be at Haymaker Golf Course in Steamboat Springs Sept. 13.